Planting a garden has the power to change the world. Regenerative gardens can help reverse climate change by restoring soil health. We're bringing victory gardens back. This time, it's for the climate. Watch and share this great video on Climate Victory Gardens featuring Rosario Dawson and Ron Finley. Produced by Green America and Kiss the Ground. Climate change is the most pressing issue of our time. Carbon dioxide levels have risen above 400ppm and there is an urgent call to sequester carbon and bring that number down to the pre-industrial level of 350ppm. Yet, it often seems like there isn’t much that can be done on an individual level to stop it. Sure, we can drive less, buy more organic and local produce, and switch to LED light bulbs. But many of the big impactful changes oftentimes seem out of reach and are focused on purchasing. There is a way that we can all be a part of the solution while taking part in a creative and fun activity. We are bringing back Victory Gardens – this time for the climate! As part of the WWI and WWII war efforts, the nation rallied to feed their communities at home and support troops overseas by planting Victory Gardens. To many this might seem a trivial effort. How much can a few gardeners grow? 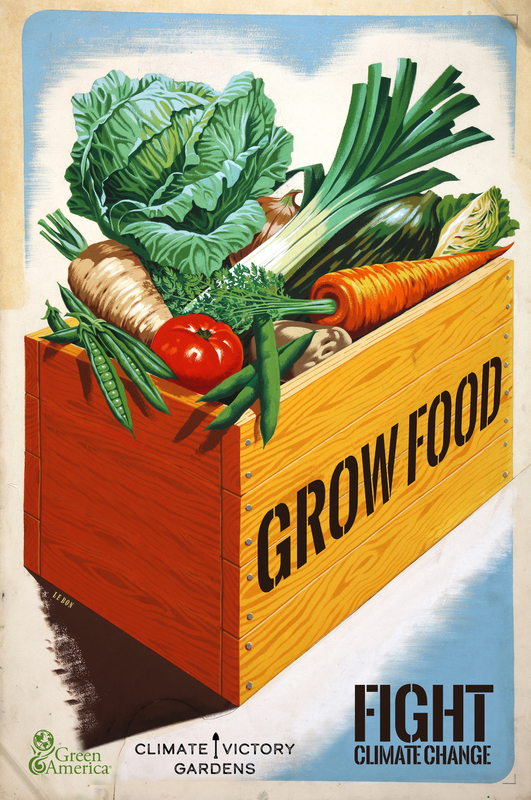 By 1944 nearly 20 million victory gardens produced 8 million tons of food, equaling about 40% of the fresh fruits and vegetables consumed in the US at the time. We are once again in the position where we, as everyday citizens, have the opportunity to use our gardens as a force for change. Instead of gardening in support of war efforts, we are gardening to fight climate change. Shifting garden practices towards principles of regenerative agriculture can be a meaningful part of reversing climate change and sequestering carbon out of the atmosphere and back into the soil. Search the map of existing Climate Victory Gardens and find a garden near you! Doesn’t agricultural need to change at a large scale? Yes, it does, and we are working on that too. But change at scale takes time and we don’t have any time to waste. We need to immediately sequester carbon from the atmosphere, putting back what has been released from the soil as a result of years of destructive industrial agricultural practices. In the 1940s the US population was around 132 million and our current population is 325 million and growing. If we could replicate that level of scale we could plant over 40 million gardens today. We can start fighting climate change in our home, school, and community gardens today! Check out our Climate Victory Gardens Toolkit! We don’t expect everyone to quit their day job and take up farming full time. But we can all play a part in our homes and communities. Climate Victory Gardens provide an opportunity to fight climate change on the ground, in the very soil beneath our feet. But how much potential does a small garden have to impact the global issue of climate change? Quite a bit! When we grow food at home in a regenerative manner; we purchase less food that has traveled across the country, we compost more food scraps and yard waste keeping it out of landfills, we increase the water holding capacity of our soil decreasing flooding and runoff, and most importantly we rebuild our soil health bringing back its carbon sequestering potential. Learn how to start your own Climate Victory Garden today with our new Climate Victory Gardens 101 Toolkit. It has all the information and tips you need to start growing healthy foods in healthy soils that sequester carbon. What is a Climate Victory Garden? How do you use your garden as a tool in the fight against climate change? How do you take action to restore your soil, to help it pull carbon from the air and store it underground. Whether you’re a beginning gardener or seasoned expert, this Climate Victory Gardening toolkit is for you. Knowledge is power, but practical advice is important too.